Factory GMC Wheels, Rims Tire Packages. These are dealer take off genuine GM made GMC oem wheels. We stock GMC Canyon, GMC Colorado, GMC Z71 Silverado pickups wheels and tire packages at the moment. 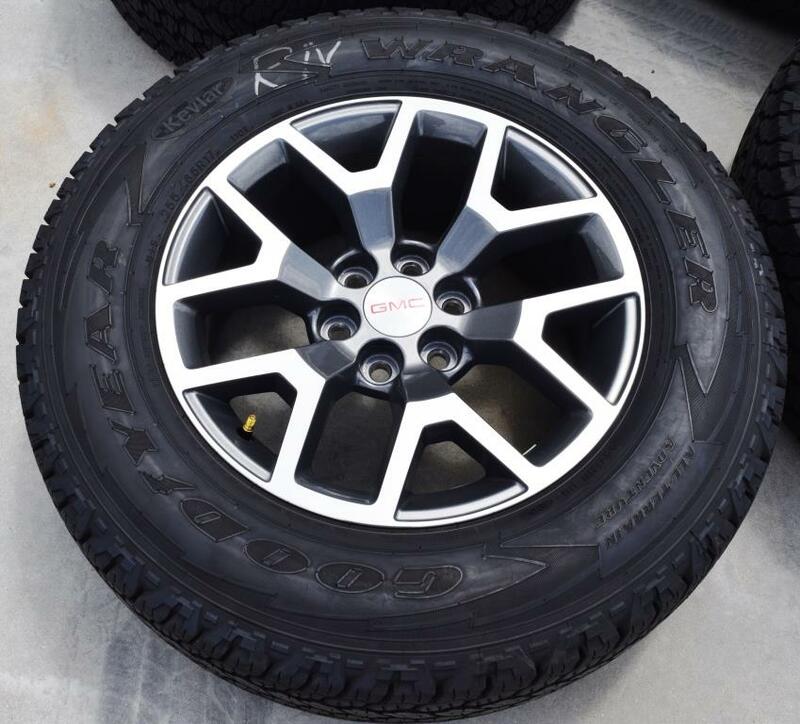 GMC Z71 Colorado 17 inch oem factory aluminum wheels fits 2015 and 2016 GMC Canyon / Colorado pickups, 2015 and 2016 Chevy Colorado and Canyon pickups only. 17×8 wheel with a +33 offset. These have Goodyear Wrangler Adventurer P255 65R17 tires that are like new. Rim MFG GM Part # 22901342. These are 6 lug with a 6×120 mm bolt pattern that only fit 2015 and 2016 Canyon and Colorado vehicles. GMC Canyon 18 inch polish oem factory aluminum wheels and tire package. These are like new dealer take offs that only fit 2015 GMC and Chevy Colorado and Canyon pickups and 2016 GMC and Chevy Colorado and Canyon vehicles. These have the 6×120 mm bolt pattern. About Steven Goss Wheels & Tires Inc.
Steven Goss is a retired insurance agency owner that buys and then resells dealership take off factory Chevy Ford Dodge Jeep Kia Toyota and Nissan like new quality oem wheels and tires. Some wheels and tires are sold individually. Some wheels and tires are also sold as a set or as singles. We also have Chevy Headlights and Front Grills in stock as well as Jeep Wrangler front bumpers, rear bumpers and steps.